THE MIDDLEWICH DIARY: SEE HOW IT RUNS! Have you ever wondered why Cerebos Salt's catch-line was (and still is) 'See How It Runs!' illustrated by a picture of a child throwing salt onto a chicken's tail? The wording is easily explained, because the fact that the salt was in 'powder' form and could be poured from a container was the product's great selling point. Prior to its introduction people would buy salt in much the same way as they did sugar - i.e. as a 'salt loaf' - and scrape off what they needed. This kind of salt, however, was very prone to 'caking' as it absorbed moisture from the air and had to be dried out frequently. In 1892, so the story goes, a French chemical engineer was advised to give his sick son calcium phosphate in order to add strength to his weak infant bones and, to make the substance 'more palatable', he added salt (obviously he had no sugar to hand). The chemist noticed that the chemical in the mixture had the effect of preventing caking of the salt. The child's restoration to health was attributed to the calcium phosphate and salt mixture, leading to the idea that the salt and chemical mixture had 'health giving properties'. Note: There are different versions of this story with the details (and the additives) varying and the chemist even changing nationality a few times, but the basic premise remains the same, with the actual salt itself always being given credit for the miraculous 'cure' rather than any of the additives. The above account of the creation of 'enriched salt' was culled from various accounts on that fountain of truth and wisdom, The Internet. It was the disparities in the different accounts which led me to err on the side of caution and to follow suit in being rather vague about the truth of the matter. "George Weddell was born in 1855 and later became a chemist with Mawson, Swan and Weddell in Newcastle-upon-Tyne. As his daughter was a poorly child, George decided to add something to her diet to strengthen her bones and teeth. Although vitamins and trace elements were unheard of at this time, he mixed small quantities of magnesium carbonate and calcium phosphate with the family's household salt. He was so pleased with the result that he felt it would be good to supply this 'enriched salt' to the general public". Given that, according to Maurice Baren, George Weddell later became chairman and managing director of Cerebos Salt, I think we can take this as the definitive account. It's interesting to note that Maurice doesn't seem to think that the claims about enriched salt being 'healthy' were in any way spurious. It would be useful to hear the opinion of a present day chemist on this, particularly in the light of the dire warnings issued by health professionals about the dangers of 'too much salt'. A rare combination, as critics will own. Thus free-running salt came into being and 'enriched salt' started to be manufactured by a new company, Cerebos (the name, as indicated above, being derived from Ceres, the Roman goddess of the wheat harvest, and 'os', a French word for bones'). So the phrase 'see how it runs' is a simple reference to the free running qualities of the new table salt. For what it's worth, I always had a vague and unresolved idea that it was somehow related to the nursery rhyme Three Blind Mice (see how they run), but how the child sprinkling salt on a small bird fitted into that idea was anyone's guess. In fact it is related to a nursery rhyme, but a completely different one. There's an old wives tale which claims that if you sprinkle salt onto the tail of a bird it will be unable to fly, making it easier to catch. One theory is that the salt makes the bird's tail feathers heavier and thus he is unable to get off the ground. A likely story, of course. And there's an old saying associated with this which says, 'If you are close enough to a bird to put salt on his tail, you're close enough to catch him'. In other words, the whole exercise is rather pointless. The idea of using salt to catch birds was immortalised in the nursery rhyme Simple Simon who, you'll recall, met a pie man going to the fair. To put upon its tail. 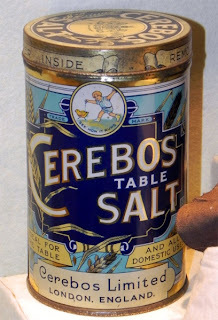 So the energetic young gentleman shown on the Cerebos packaging through the years is really there just to demonstrate that consuming Cerebos salt gives you energy and strengthens your bones, enabling you to chase small birds and sprinkle salt on them, should you wish to do so. 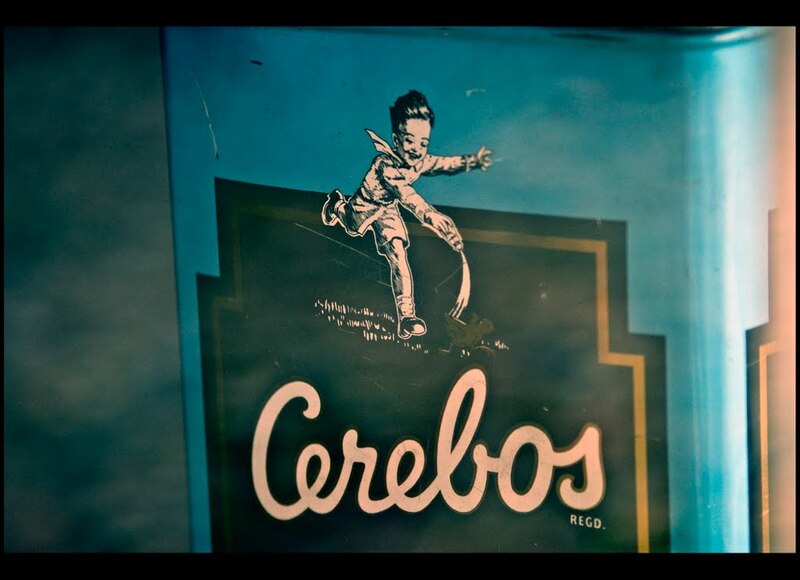 Your sprinkling will be made easier if you use Cerebos, of course.. 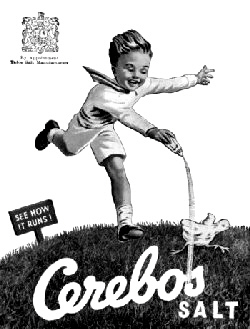 In this ornate (and probably highly collectable) version of the Cerebos packaging the small boy appears to be very young indeed, and looks very close to catching the chicken. In this chic French version, complete with accents on the Es and a highly stylised rendering of the drawing, he's grown up a bit and obviously slowed down a lot as the bird, which by now is no longer a chicken and could be a canary by the look of it (or is it one of the Three French Hens? ), looks like it is getting away from him. On this modern packaging we see the 'classic' version of the boy managing to get a fine flow of Cerebos out of his salt cellar. It's hard to see what the bird looks like. Perhaps he's smothered it in salt and it has breathed its last. In this very up to date version from South Africa adorning modern supermarket packaging the boy has been simplified. He's lost his scarf and his baggy shorts are now slimline as he scores a direct hit on the unfortunate bird. 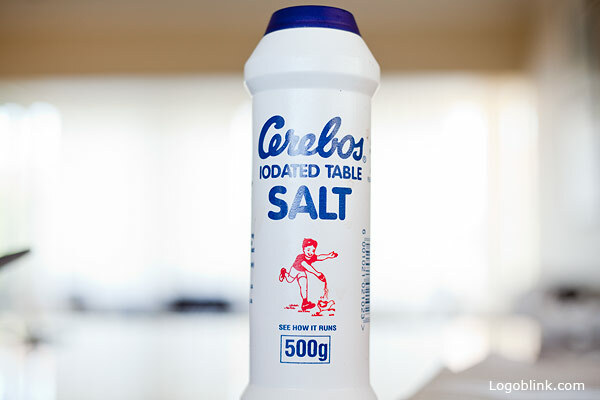 Since 1995 South African law has made it compulsory for all table salt to be iodised (or 'iodated' as it says on this package). This is part of a world-wide initiative to combat iodine deficiency, particularly in children. The original Cerebos factory was in Greatham near Hartlepool. Middlewich's long association with Cerebos began when the company bought the Middlewich Salt Company after World War II. For many years the Greatham and Middlewich works worked together in developing new products and manufacturing and packaging them. 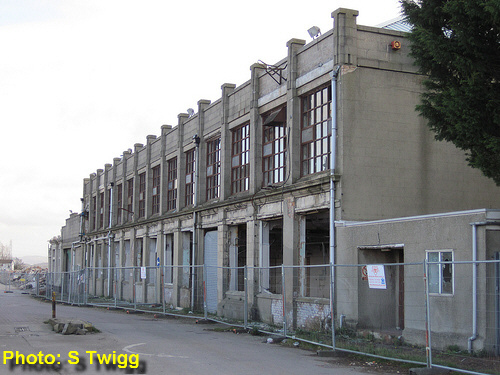 There was even, as can be seen from comparing the picture below with this one, a sort of 'family resemblance' between the two factories. Like their Middlewich counterpart the Greatham works were found to be surplus to requirements and were closed in 2001. In 2011 the buildings were in such a bad state of repair that the Greatham Salt Works, like the Middlewich Works before it, inevitably passed into history. 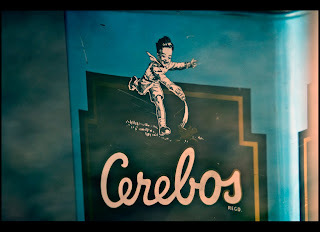 Cerebos Salt, however, is alive and well and is one of the most recognisable and well-known brands all over the world. Very interesting. Thanks! I came here looking for the meaning of the logo and wasn't disappointed.